As a young boy growing up in Altadena, California Hank Becker found an open garage with a race car in it while he was running his paper route. He kept returning to that sacred spot and hung around the door until the owner (Joe Gemsa) invited him in to help polish some of the shiny stuff. This started an apprenticeship as “a stooge” a.k.a. “a grunt” (an unpaid helper) with Joe becoming Hank’s mentor and in many ways Hank becoming like a son to Joe. Little did Hank know at the time that Joe was called: “The Great Gemsa” and the king of the four bangers and was a well-known dealer of race cars and racing parts, Offenhauser engines and was a master welder. He was also recognized as an excellent championship driver with sprint cars throughout the 40’s and 50’s. He built and raced NASCAR vehicles, but was best at making exceptional dual overhead cam four banger heads that pulled 220 from flattie 4-bangers. His Model T heads are now highly collectible and very rare. Gemsa worked out of a boxcar sized shop and created some of the most desirable speed equipment of the day. Gemsa Speed Equipment was the go-to place for T’s, A’s and B’s. 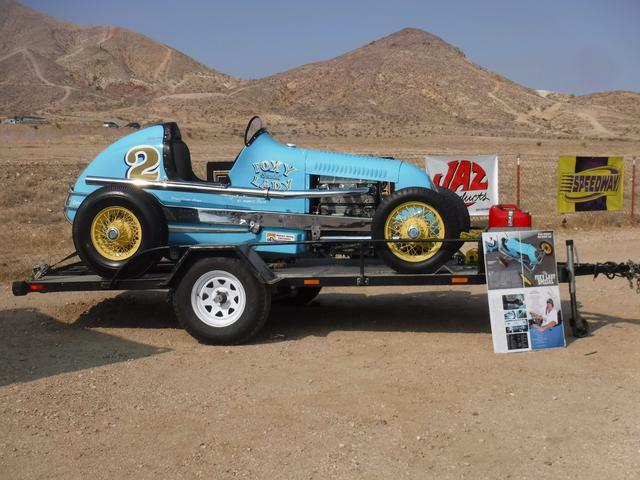 By the age of 12, Hank Becker was driving Joe’s push cars at the race track. They remained lifelong friends (over 60 years) until Joe’s passing in 1995. It is believed that the Foxy Lady was built in the 1930’s and may have been the Offenhauser Special driven by Hal Cole when it ran a 220 Offenhauser engine configuration. But, from ’36 to 1940 much of the history during this period has been lost. From 1940 until after WWII the car was in Ivan Hollands garage in So. Pasadena, California. Holland sold the car to Don Greene who unfortunately crashed it in 1947 at the Oakland Speedway and then sold it to Joe Gemsa. As a side note, the Oakland Speedway was the first major racing track between Oakland and Hayward which was a one-mile banked dirt oval track that was constructed in 1931, operating throughout the Great Depression and postwar years. The track featured AAA National Championship races with Indy cars and drivers from 1931 until 1936 when the AAA pulled out of the West Coast. Thereafter, the track still featured racing by members of the Bay Cities Racing Association in roadsters and motorcycles, as well as “big cars” stock cars and midgets. It was known as the fastest dirt track in the nation. Bud Rose soon convinced Joe to redo the car like his Rose-Miller racer (long tail and wide headrest). The original chassis was built by Clyde Adams (Texas) and is still with the car. The original ball nose/grille was replaced over 50 years ago with a track nose. The Lady had a typical 30’s ear low tail design. Joe Gemsa rebuilt the racer in 1947 with a postwar type high tail design and added a new post war higher tail design and that new headrest suggested by Bud Rose. The Lady was raced both in the West Coast and in throughout the Mid-West in 1960 when it was retired into the Gemsa family garage. Hank acquired the car from Joe in the 70’s and they rebuilt it in ’79 for Hank to race alongside Joe on their Midwest tours. Chuck Porter did the paint work and body modifications “with a pick and hammer and NO lead or bondo” being used. Chuck Porter Blue was the original three shaded color that was applied in Joe’s garage. Having been banned from all of the hill climb events (Signal Hill, etc.) for being too fast (the frame from that car is currently hanging in the museum at Speedy Bills in Lincoln, Nebraska) with the engine being stored on the bench in Joe’s garage. Before long it ended up in the Lady. However, soon after that installation, a highly modified 1925 Model T engine with a dry sump system, Model A crankshaft, dual Weber side draft carbs, magneto and special overhead conversion with one of Joe’s experimental heads. Many of these parts were stamped with personal notes on them to Hank!! Hank once noted that the car was extremely fast and that he had beaten a number of 270 Offy cars with this engine! Hank continued racing this car into the 90’s than sold it to Bud Sheldon for a short time before reacquiring the car. As an antique race car the “Foxy Lady Special” has run the gamut of tracks and events from Florida to Canada and all points between. As the current owner and partner of the car with Hank we work aggressively to maintain the “patina” and historical aspects of the car. Hank wanted the car on the track regardless of how fancy it looked. Unfortunately, Hank was in the latter years of an aggressive Cancer and coupled with his diabetes was unable to continue working on the car. Many of his last years were just being helped out of the house and placed in a chair to laughingly point out what, where and how he thought things should be done. Many days I would be laying on the garage floor looking over at that empty chair wishing he was still in it. We had a nickname for everything and if you ever see the car, on top of the cowling is Hank “dingleduffus” Becker! Hank’s last laps were at Willow Springs. We had to lift him into the car…you could feel and see the excitement in his face. The legs just didn’t work too good anymore and using the clutch was a challenge. Thank goodness for the hand brake on the side of the frame. Hank rolled out a half dozen laps…. I wish I could have been in his mind as the track unfolded under him. Soon after he brought the car back to our pit he was shaking, tears coming down his face but behind that look was a peaceful contentment and finality in his demeanor. I think he realized that it would be his last time driving the Lady. As I was pulling him out of the car, he looked at me with sadness and yet a look of contentment as he said” the Lady is yours take good care of her”. We lost Hank some months later and as I promised him, began a compete safety and appearance redo of the car. After all, a Lady has to have some new duds!! During the update I have repainted the car in a lighter Blue color, added new vinyl lettering and re-chromed as many of the old rusty items as I could. Interestingly the original chrome frame is in excellent condition and I won’t allow any grinding or welding on it. In addition, I added a fuel cell under the rear tail for safety purposes all the while never changing the nostalgia look of the car. In the past years, I have concluded that the car will be driven in a capacity of “show” and not raced. Many of the events she is “static” displayed near the grandstands for appearance purposes. I know that Hank and so many of the others would be appreciative of the retention of the car’s heritage. Oh, when I work on the car…. well, I put a lawn chair off to the side in the garage.